This set of HTML Questions and Answers for Freshers focuses on “Choosing Editors and IDEs”. 1. Which of the following is not an IDE? Explanation: Dreamweaver is an Integrated Development Environment (IDE) tool. Aptana Studio 3 is an open-source integrated development environment (IDE) used for web applications. BlueGriffon 1.5.2 is an integrated development environment powered by Gecko. TextEdit is a simple, open-source word processor. Explanation: An integrated development environment (IDE) or interactive development environment is a software application that provides comprehensive facilities to computer programmers for software development. An IDE normally consists of a source code editor, build automation tools and a debugger. 3. We can define ________ number of sites with one copy of dreamweaver installed on our computer. Explanation: Dreamweaver is an IDE to build custom web apps and applications. There is no definite liit to it. 4. What should we add to a template in Dreamweaver in order to control where page content goes? Explanation: A template is a special type of document that you use to design a “fixed” page layout; you can then create documents based on the template that inherit its page layout. Editable template regions control which areas of a template-based page a user can edit. Frames appear inside a web page. 5. Blue Griffon is based on ________ rendering engine. Explanation: BlueGriffon is a new WYSIWYG content editor for the World Wide Web. Powered by Gecko, the rendering engine of Firefox, it’s a modern and robust solution to edit Web pages in conformance to the latest Web Standards. WebKit is a browser engine used in safari. Presto is a dynamic engine. Explanation: Before you start creating a more complex page design with Dreamweaver’s Swap Image behavior, look at a finished page. Swapping means replacing any or all images on the page. While swapping images, it is important to make all images of same size (height and width). MIME stands for “Multipurpose Internet Mail Extensions. Explanation: Blue Griffon 1.5.2 is a new WYSIWYG content editor for the World Wide Web. Blue Griffon 1.5.2 includes tools for developing HTML5 pages. It can abstracts out many CSS3 effects, supports direct embedding of audio and video files. Blue Griffon 1.5.2 does not support swapping of videos of any length. 8. Maqetta is an open source initiative of the Dojo Foundation to geared towards visual designers through a WYSIWYG user interface. Explanation: Maqetta is an open source initiative of the Dojo Foundation to build an HTML5-based editor geared towards visual designers through a WYSIWYG user interface. Maqetta was developed by IBM and then donated to the Dojo. 10. Which of following statement is true? i. Cloud9 has gained particular interest for its integration with GitHub and Bit Bucket authentication integration and real-time collaboration. ii. Cloud9 does not account for SSH and FTP access. Explanation: Cloud9 IDE is an online integrated development environment, published as open source from version 2.0, until version 3.0. It Supports for the following code repositories: 1) GitHub, 2) BitBucket, 3) Mercurial repositories, 4) Git repositories, 5) FTP servers. Cloud9 support deployment to 1) Heroku 2) Joyent 3)SFTP/FTP. 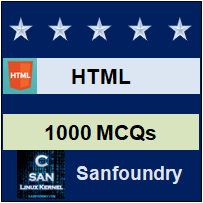 To practice all areas of HTML for Freshers, here is complete set of 1000+ Multiple Choice Questions and Answers.